All scores are claimed scores unless otherwise noted. 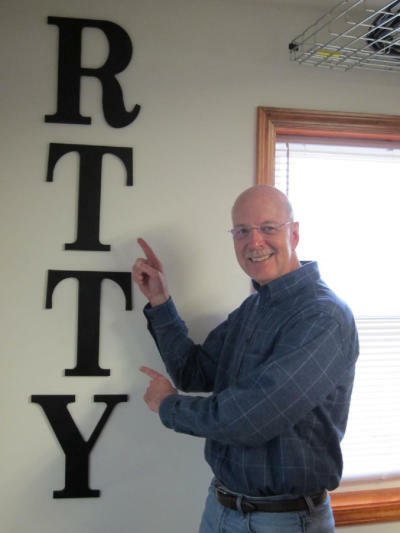 January: ARRL RTTY Round Up • QSO’s: 0 • Mult’s: 0 • Score: 0 • Op Time: 0 Hrs Comment: To make a long story short, I did not operate in the 2013 RTTY RU, ending my run of 6 consecutive years of having the top low power, single op score from Indiana. Bummer. January: NAQP CW (Final Score) • QSO’s: 415 • Mult’s: 137 • Score: 56,855 • Op Time: 6 Hrs Comment: IN 2012 I operated the full 10 hours for this contest and racked up my highest score ever (139,441 points from 779 QSO’s). As was the case for the RTTY RU, circumstances would not allow a full 10-hour operation for 2013 but I did manage to get on for a few hours here or there in order to generate some points for the NAQP challenge contest between the NCCC and the SMC. January: NAQP SSB (Final Score) • QSO’s: 149 • Mult’s: 71 • Score: 10,579 • Op Time: 3 Hrs Comment: The first time I have operated in this contest as SOLP since 2010. Goal was to generate some points for the NAQP challenge contest between the NCCC and the SMC. 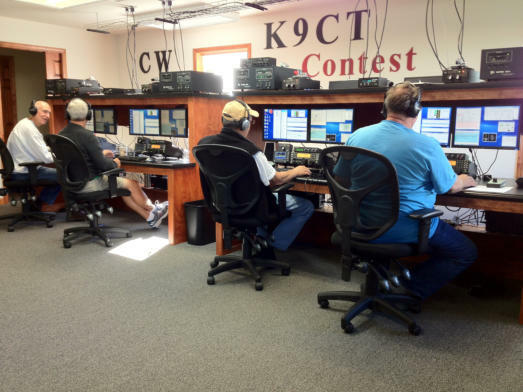 February: CQ WPX RTTY @ K9CT • QSO’s: 4,180 • Mult’s: 1,068 • Score: 12,872,604 Comment: I had the honor and privilege of joining Craig, K9CT, at his super station west of Peoria, IL. This was a M/2 operation; other team members were Ralph K9ZO, Mike N7MB and Steve AI9T. We had a goal of breaking the previous 9-Land record of just under 4M points. We blasted through that in the first 12 hours and ended up with a raw score that would rank fifth all- time in the world for all categories. See pictures here. February: NAQP RTTY (FInal Score) • QSO’s: 687 • Mult’s: 163 • Score: 111,981 • Op Time: 10 Hrs Comment: My best ever score in an NAQP RTTY Contest and good for first place among Indiana stations. February: WIQP (Final Score) • QSO’s: 143 • Mult’s: 51 • Score: 16,600 Comment: A better score than last year, thanks to a rainy day that made outside work impractical. First place for Indiana stations. March: BARTG RTTY Single Operator Single Band 40 • QSO’s: 210 • Mult’s: 42 • Continents: 6 • Score: 45,360 • Op Time: 13 Hrs Comment: First time operating this contest since 2008. This effort was calculated to place in the single op single band 40M category and the resulting effort would have been second world, first NA for 2012. March: CQ WPX SSB as K9WX/M • QSO’s: 34 • Pt’s: 70 • WPX: 32 • Score: 2,240 Comment: Operated mobile to test set up for the May INQP. This was a new installation in a new vehicle. Was able to work a surprising amount of DX and very few close-in stations, which will be a problem in the INQP. More testing needed. April: EA RTTY • QSO’s: 75 • Pt’s: 309 • Mult’s: 37 • Score: 11,433 Comment: A 40M single band entry. Had intended to make a major effort but got a late start and missed the prime high band opportunites to work into Europe, so opted to switch to a single band entry to take advantage of evening and early morning opportunities. 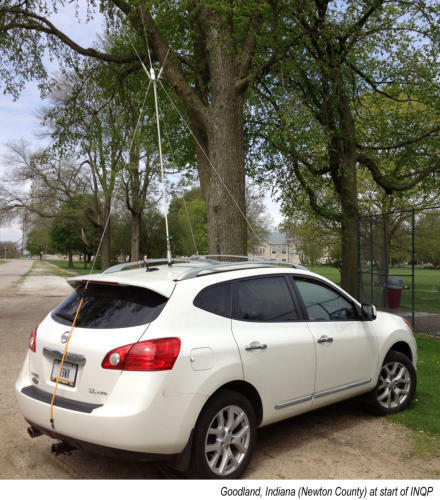 April: MIQP Final Score • QSO’s: 164 • Mult’s: 85 • Score: 20,570 • Op Time: 5 Hrs Comment: Several of the mobile stations had GREAT signals. It would be instructive to be able to see their installations. This score was been good for first place for IN stations and 10th for the US eastern region. April: FQP • QSO’s: 18 • Pt’s: 56 • Mult’s: 18 • Score: 1,008 • Op Time: < 1 Hr Comment: One sure sign of spring is the Florida QSO Party, held every year during the 4th full weekend of April for the express purpose of getting everyone warmed up for the Indiana QSO Party which occurs the following week. I made a grand total of 18 FQP QSO's, all from my driveway to test my INQP mobile setup. And am pleased to say it appears everything is working well. MAY: INQP (Final Score) • QSO’s: 587 • Pt’s: 1046 • Mult’s: 112 • Score: 117,152 • Op Time: 12 Hrs Comment: A major mobile effort, with stops at nine different locations, 6 of which were county lines, a total of 12 counties, and good for 3rd place among Indiana mobiles. I was in the field for the entire 12 hour contest period. But, the log only shows on-the-air time of 6:40. Most of the balance was spent driving plus a small amount of set up and tear down at each stop (I had 3 different Hustler masts in use to cover the planned bands and modes). My pre-contest plan showed 3:40 of driving time between stops so if you throw in nearly an hour for dinner (an unplanned luxury) and a couple of rest stops that's 12 hours. If I had it to do over: I would spend more time on 20M phone to try to grab more non-IN mults. I thought I would be able to snare more of these on 40M phone but that didn't happen for some reason. My biggest oops! : I carefully collated the published schedules for all the mobiles and printed them out on a single sheet of paper to use as a reference during the contest. Unfortunately, I failed to print out MY schedule to take along! I was able to use my iPhone to bring up a copy of the email of my schedule that I had posted to the INQP reflector, so in the end this was not a major oops. But, still. . . . . MAY: 7QP (Final Score) • QSO’s: 92 • Mult’s: 30 • Score: 8,250 Comment: Run concurrently with the INQP. Not sure why but my entry was classified as mobile multi-single low mixed, taking first place in that category for non-7’s. MAY: NEQP • QSO’s: 67 • Pt’s: 130 • Mult’s: 24 • Score: 3,120 Comment: Run concurrently with the INQP. JUNE: Field Day Op at W9LDX, 1A IN • QSO’s: 1,284 • Score: 4,682 including bonus points Comment: Strong storms created S9 noise on 40M and 80M throughout most of the contest and our QSO total was down significantly from our 2011 1A entry which took 5th place in that event. It turned out that everyone’s scores were down. We finished first in Indiana for 1A, first in the Central Division for 1A and 6th in the country for 1A. JULY: RAC Canada Day • QSO’s: 171 • Points: 970 • Mult’s: 12 • Score: 11,640 Comment: A 40M single band entry. Managed to top my 2012 score which ended up taking first place, world, for the 40M single band entry category. This year it was only good for first place, USA. JULY: NAQP RTTY (Final Score) • QSO’s: 398 • Mult’s: 121 • Score: 48,158 • Op Time: 6 hours • Team: SMC Picnic Basket • Comment: Operating time was limited due to other commitments. Band conditions were weird and during the course of the contest I would have said not very good. But, the rates at times were incredible. I made 92 QSO’s during the 0000z hour which is unprecidented for me. This contest does not have any activity on 160M and, as is typical, rates dropped off dramatically after 0400z. AUGUST: NAQP CW (Final Score) • QSO’s: 667 • Mult’s: 148 • Score: 98,716 • Op Time: 9.5 hours • Team: SMC Team S • Comment: My first time ever with a raw score over 100K for the August NAQP, although the total was eventually reduced in the final results. Still good for second place, Indiana. Although the Butternut vertical showed it was properly tuned for 160M (according to my RigExpert antenna analyzer) the radios could not tune it and I only managed 4 QSO’s on 160M, which significantly reduced my multiplier total. Upon inspection the next day, it appeared a squirrel or large bird may have perched on top of the 160M coil, compressing it and thus lowering my resonant frequency down to about 1700kHz. AUGUST: NAQP PH • QSO’s: 24 • Mult’s: 14 • Score: 336 • Op Time: 0.5 hours • Comment: Thirty minutes at the start of the contest. AUGUST: CW Open Session 1 • QSO’s: 115 • Mult’s: 99 • Score: 11,385 • Op Time: 2.25 hours • Comment: First time operating in this contest. Had good rates for the first 2 hours but when it was time to drop down to 80M and 160M both bands were solid S9 noise from local storms and that was all she wrote. September: WAQP • QSO’s: 122 • Points: 331 • Mult’s: 26 • Bonus Points: 1,000 • Score: 9,606 • Op Time: 4 hours • Comment: First time operating the Salmon Run since 2003. Most op time was on day 1. Unfortunately, there was relatively little activity on the low bands, at least when I was in the chair. September: CQ WW RTTY @ K9CT • QSO’s: 4,845 • Points: 11,989 • Mult’s: 757 • Score: 9,075,673 • Comment: Back to Craig’s contest station, this time for the CQ WW RTTY event. We started with the goal of breaking the former W9 record of 1.4M and passed that mark at 1400Z on day 1; we then targeted the former NA record of 5.8M and passed that mark at 1400Z on day 2. Shortly after, we passed the 2012 winning score of 6.4M. Despite these stellar accomplishments, it appears that we would, at best, finish in second place US and world due to an even more stellar performance at W1UE. Our six-member team included Steve AI9T, Bill K3WA, Ralph K9ZO and Roger N4RR along with K9CT and moi. October: ILQP (Final Score) • QSO’s: 200 • Points: 318 • Mult’s: 80 • Score: 25,440 • Comment: A causal and pleasant pace but still spent over 5 hours in the chair. Ended up taking first place for Indiana stations and 8th place US for non-Illinois stations. Most contacts were on 40M with a few on 80; a lot of the stations told me I was really loud. Of course, you want to be loud in a contest but those comments are probably telling me the antenna (the Alpha-Delta DX-CC) might not do much when it comes to DX. November: SS CW (Final Score) • QSO’s: 702 • Mult’s: 83 • Score: 116,632 • Op Time: 17 Hours • Comment: My all-time best score is SS CW, good for first place among Indiana low power unlimited stations. Also, the earliest in the contest to record the sweep: a VE2 called in at 1130z on Sunday morning. It’s funny how the activity level varies from section to section each year. There have been years, for example, when I would pay a huge price for an SF or SC. This year, they were in abundance. December: ARRL 160 • QSO’s: 173 • Mult’s: 43 • Score: 14,878 • Op Time: 4 Hours • Comment: A rare QRP entry for me. I entered the 2011 contest in the QRP category and had the top QRP score from Indiana. So, this was an effort crassly calculated to win a certificate, although I ended up with a much lower score this year. I used my end-fed long wire exclusively and can’t say that it was any better than my Butternut HF9V in terms of signal strength but, unlike the Butternut which has a usable bandwidth of about 30kHz, I could easily match the bottom 100kHz of the 160 band with the long wire using the internal tuner of the radio, making the long wire the better choice for this contest. December: 10M RTTY • QSO’s: 16 • Mult’s: 9 • Score: 144 • Comment: Thought I might be able to work a new country or at least some new band/mode countries, but no joy. December: RAC Winter • QSO’s: 164 • Mult’s: 16 • Score: 17,728 • Op Time: 5 Hours • Comment: My usual 40M low power entry for this friendly little contest, resulting in first place - world for non-VE stations. Although I will confess that I started getting frustrated at the number of VE’s who would call CQ on phone around 7075 but not listen up. 143 of my 164 QSO’s were on CW but provinces are multipliers on both phone and CW so it’s important to be able to work the mults when you hear them on phone. December: Stew Perry Top Band Distance Challenge • QSO’s: 118 • Score: 296 • Comment: Best (and only) DX was a KH6 for 14 points. Antenna was a 57' end fed wire using a Balun Designs 9:1 unun (see http://www.balundesigns.com/servlet/the-100/9-cln-1-9-dsh-1-unun/Detail) up about 30 feet. This antenna seems to operate as well as my previous 160M antenna, (a Butternut HF9V) but has the advantage of being able to tune a much wider bandwidth using just the internal tuner of my 756ProIII.